TYPHON speaker cables were created to offer reference-level performance in more accessible price range by sharing several key components used in the ASP Reference line, thereby offering many similar sonic attributes and features. Most importantly, TYPHON speaker cables use the same "expanded cross-section" AeroStrandUltra™ silver/palladium conductor type as STAGE III's Flagship Medusa cables. This unique alloy is electromagnetically resistant to various types of external interferences and induced distortions. TYPHON's unique "multi-twisted pair" conductor geometry effectively rejects induced noise in conjunction with our exclusive ASPIS™ shielding and conductor damping, allowing more sonic immediacy, focus and fluidity to come through compared to more traditional shielded cable designs. Made completely by hand with absolutely no "off-the-shelf" or commercially available components. All TYPHON speaker cables are terminated with our proprietary advanced HYPERION high-current solid silver spades or high-performance silver banana plugs. Sample a complete set of STAGE III TYPHON speaker cables in your own system and experience the essence of our A.S.P. Reference line at a considerably lower price point. 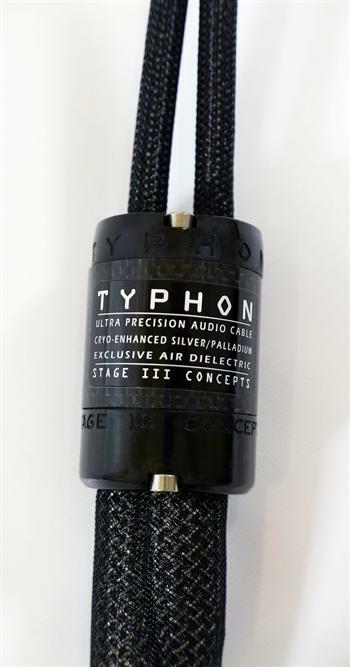 TYPHON speaker cables employ 6 cryo-treated, expanded cross-section, continuous cast silver/palladium AeroStrandUltra™ ribbon conductors in a triple, individually shielded twisted pair configuration. Minimized wall, high purity PFA Teflon air-tubes. Multi-layer construction with silica/ceramic/ferrite mechanical damping/shielding layer, enclosed in a super-soft Tygon polymer outer damping tube. Exclusive "ASPIS™" outer shield (plated copper/carbonized nylon). Custom hand made woven carbon fiber housing. Cryo-treated, high-current, custom made solid silver spade terminations standard. Beryllium copper/silver bananas optional.